I was planning on reading this long before I did, but here I found myself, a year after it was published, reading all about this wonderful family. This is a book about four brothers and their relationship with their dads. The thing I loved about this, though, is that the fact that they’re the children of a gay couple is not at the forefront of this story. The primary plot point of this book was the children themselves, and their growing pains as they evolve as individuals and as a family. It was refreshing to read a book that wasn’t all about the parents here. Yes, at one point Sam (the eldest at age 12) makes a comment about “theater kids” and then has to backtrack a bit, but that’s it! As someone who reads a lot of LGBTQ lit and seeks out good stories, I was so thoroughly pleased with this one. Good on you, Levy! Speaking of… Guess who got a shout-out from the author after her tweet? Agree? Disagree? Do you have a book featuring two dads that you loved more? I’d love to hear from you! I find myself reading through the Rebecca Caudill Young Reader’s Book Award List for this year, and I’m so pleased I made this decision. Most states have these lists, this is the list of books educators and librarians form Illinois want kids to read this year. It’s geared towards older elementary-middle school-aged children. I never would have chosen this book on my own. Not because the premise isn’t interesting to me (it’s set during WWII in Great Britain, ad the protagonist is a girl with a club foot), but because I generally don’t like historical fiction. It pains me to say it because, as a librarian, aren’t I supposed to like everything? I don’t. But I really enjoyed this book. Ada has a club foot. Her Mam doesn’t want the neighbors to know about her daughter’s deficiencies, and so has forbidden her to leave the house. When she “misbehaves,” her Mam shuts her in a cupboard under the sink where cockroaches and rats like to crawl on her because it’s so damp. Ada’s brother Jamie is six, and given their socioeconomic standing in combination with his age, has no concept of why his sister is treated the way she is. When the children are sent out of London because of the threat of air raids, Ada and Jamie run away in the night and join the other children at the train station. Hours later, they’re in a station in Kent where Ada realizes, to her embarrassment, that they’re the dirtiest children there. Nobody volunteers to take them in. The children are brought to a woman who lives alone in a large house, who’s “friend” Rebecca has recently died. She’s depressed and doesn’t believe she has any right to take care of children. Slowly, they start to heal each other’s emotional wounds. Susan, the children’s caretaker, has a good understanding of psychology as she seems to know how to calm Ada down when she gets truly upset. While this story is historical fiction, this book’s sucker-punch was how the children overcame their mother’s abuse. After years of telling the neighbors that her daughter was too stupid to leave the house (I’m paraphrasing here. The words used were not the kind I’d like to repeat) they were finally in the custody of a loving adult. There are real life children who went through that kind of abuse then and now, whether because people were too poor to afford treatment for physical handicaps or because they didn’t understand them well enough. This story has a happy ending of acceptance and friendship for the children, as many of the true victims of abuse don’t. Has anyone else out there read this book? If you haven’t, would you based on his review? Here’s an example of an excellent audiobook I never would have found if it weren’t for Hoopla. What’s all this “Hoopla,” you may ask? It’s a new database at my place of work that has the most attractive interface of any library e-content book I’ve ever seen. On to the book review! I had an inkling I’d like this one based solely on the fact that it’s a retelling of the Baba Yaga stories out of Russia. And it doesn’t try to be anything else. In fact, one of the first interactions our main character, Mary, has with anyone at the house is with Baba Yaga’s assistant, who quickly informs her that Madame Z., as she’s known throughout the book, is trying to fatten her up so she’ll be plump enough to eat. But Mary is too resilient for that. She’s much braver than anyone bargained for, and that comes in handy. Replete with a flying mortar and pestle, a house that runs around on chicken legs, an enchanting cat, and a town full of otherworldly neighbors, this is a brilliant retelling. Let’s face it, it’s hard to make all that work and still seem menacing, but Marsh pulls it off. I’d also recommend this audiobook above the text version for anyone trying to sell this book to children. The pronunciations are very difficult here, especially to those of us who aren’t familiar with Russian. I adored this book, especially after the disaster that was A Whole New World by Liz Braswell. I was just really pulling for Disney/Hyperion to slay it on this awesome book, and they really pulled through for me. 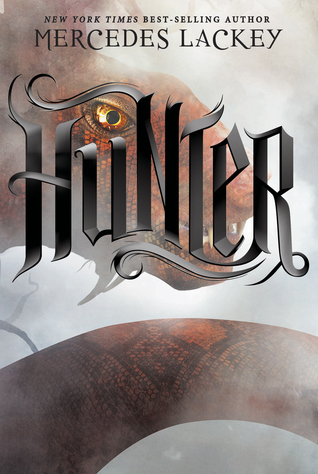 In a world where mythical creatures called “Othersiders” have reshaped society, it’s up to the Hunters to keep humanity safe (and alive). Each is armed with a pack of dogs (usuallyl 3-4) from the Otherside, but Joyeux Charmond has the largest pack out of the group of hundreds of hunters she lives with. From the moment she moved from her small town to the big city, she’s been on guard. Unsure of whether her uncle–a man of power–can be trusted, she worries that he or his Psimon bodyguard (a mind reader) might try to end her life. Her rosy ideals are not ready for a life where she must guard herself from even her fellow Hunters. Joy must decide who to avoid and who to trust, especially in this (literally) post-apocalyptic world. If you’re a big fan of mythology and folklore, this is for you. It’s got everything from Cerberus to a pack of vampires and sneaky dragons. It’s also deeply disturbing because of the religious references. It seems like how radical Christians would act if they weren’t chosen for the rapture, which is what the radicals think happened. Hunger Games fans will enjoy it, as will any fantasy fanatic.